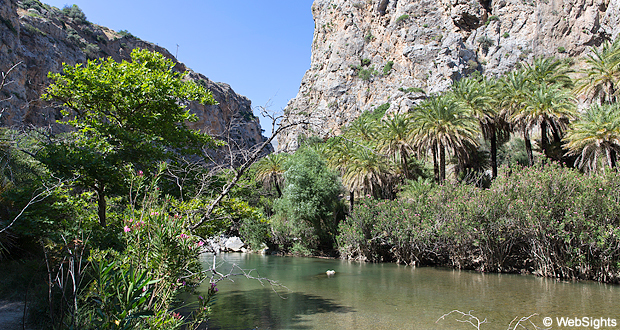 Preveli is located on the south coast of Crete, approx. 10 kilometres by car from the town Plakias. You can park your car for free in the big parking space, from where it will take 15-20 minutes to walk to the beach. It is also possible to go by boat to Preveli from either Plakias or Agia Galini. 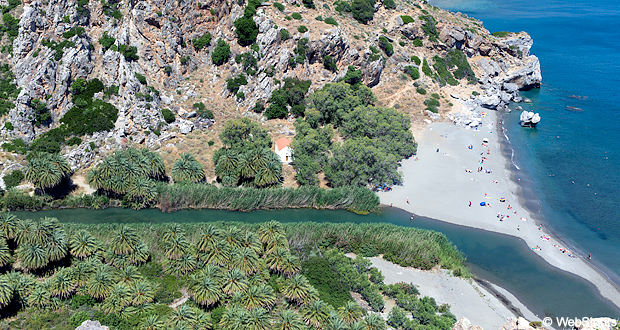 Preveli is the second largest palm beach in Crete and a magnificent natural experience. The many palm trees grow from a very long gorge surrounded by steep mountains and in the middle, a wide stream nourishes the date palms. The water comes from the mountains and in the gorge, the stream turns into sort of a long lake, where it is possible to go bathing. The water is rather cold, but it is a rare and wonderful experience to go swimming so close to the exotic palm trees and impressive rocks. The beach itself is located in a conservation area, and therefore the authorities have decided that there should be no facilities such as sun lounges, sunshades and showers at the beach. So it will be a good idea to bring your own beach parasol. The sand is rather coarse and there are pebbles along the waterline. A few metres into the water, there is a high rock, which many people believe looks like a mast. It will require a vivid imagination to see the resemblance, but the rock is still very impressive. The walk from the parking space to the beach is hard on small and a bit older children. Unfortunately, the water also deepens rather abruptly. On the positive side, there are usually no big waves. 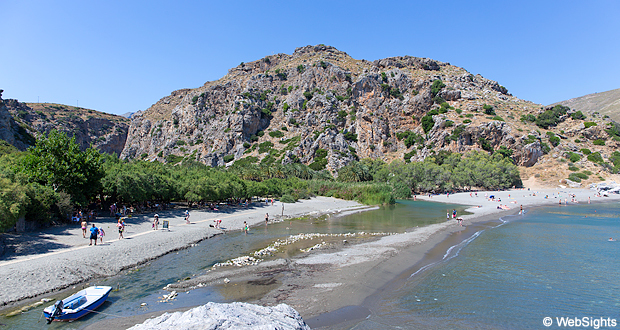 There are no water sports activities at Preveli beach. Preveli has a nice café hidden between the trees behind the beach. However, it is still possible to find a table in the sun, or you can buy food, ice cream and drinks to take to the beach. The nearest holiday resort is Plakias, which has a fine selection of small and medium-sized hotels. 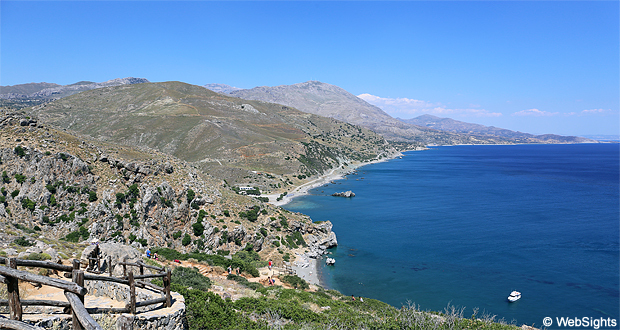 There is a boat between Plakias and Preveli several times a day. The nearest large holiday resort is Rethymnon, which is located on the north coast of Crete. The trip across the island is a lovely natural experience, particularly the Kourtaliotiko gorge. The river Megalos Potamos runs at the bottom of the gorge, which is actually the one that has its outfall at Preveli beach. In the top left corner, you can see the parking space. The bright line is the path to the beach and it can be quite a walk on a hot and sunny day.